Once again, those of us who depend on Metro North’s railroad commuter service found ourselves bereft of adequate transportation to travel to work in Manhattan. Once again, the Metropolitan Transportation Agency (MTA), which runs Metro North, urged us to avoid Manhattan by telecommuting from our homes for the duration of this service disruption. And, once again, New York State will double tax every Connecticut resident who followed the MTA’s advice by telecommuting from his home in the Nutmeg State. New York’s double taxation of nonresident telecommuters has emerged as an issue of nationwide import as the Empire State sends income tax bills throughout the country, taxing individuals who work at their out-of-state homes for New York employers. Other states, seeing New York get away with its income taxation of nonresidents who work outside New York’s borders, are emulating New York by taxing nonresidents who work at home. The American Legion, at its 95th national convention in Houston, noted the deleterious impact of such extraterritorial income taxation on “service-disabled veterans who own home-based businesses.” The Legion joined other veterans, disability rights, and telecommuting groups in calling for federal legislation to prevent states from taxing individuals who work at home beyond the boundaries of the taxing state. Last May, Metro North service was disrupted when two trains collided near Bridgeport, Connecticut. The most recent Metro North incident occurred on Wednesday, September 25th when a high voltage feeder cable failed without warning, cutting electrical service to eight miles of railroad track. This failure caused Metro North “to significantly reduce train service.” In response to this service reduction, the MTA, as it did in May, urged individuals to stay at home, telecommuting to work rather than burdening the limited train service Metro North could provide to Manhattan. Unfortunately, New York State, pursuant to its so-called “convenience of the employer” doctrine, will double tax every Connecticut resident who followed the MTA’s advice by working from home in the Nutmeg State. Under the employer convenience doctrine, the Empire State taxes the income of any nonresident who telecommutes from his out-of-state home for a New York employer, even though on such a day the nonresident never sets foot in the Empire State. On a day I work at home, it is Connecticut which legitimately taxes the income earned on that day. As a Connecticut resident, I am subject to Connecticut’s jurisdiction to tax all of my income. Moreover, on the days I telecommute from my home, I receive all of my public services from Connecticut. If, for example, I need an EMT on a day I work at home, it is Connecticut and its localities, not New York, which provides that service. However, New York taxes the income earned on such a work-at-home day even though such income is earned outside New York’s borders. New York provides no tax credit to the nonresident telecommuter to avoid double taxation of that income. Typically, the home state doesn’t provide a credit either – and shouldn’t because the home state (rather than New York) provides public services to the telecommuter on the day he works at home. The result is double taxation — which is what will happen to any Connecticut resident who followed the MTA’s advice and worked at his home in the Nutmeg State during the Metro North service disruption. New York will tax the income earned by these telecommuters at their homes in Connecticut while providing no credit for the income taxes Connecticut legitimately imposes for the income earned that day within the borders of the Nutmeg State. New York’s aggressive projection of its taxing authority beyond its boundaries is not confined to the states adjacent to New York nor is such extraterritorial taxation imposed only by New York. In two well-known cases, New York taxed Mr Thomas Huckaby on the income he earned working at his home in Nashville, Tennessee and taxed Mr Manohar Kakar on income he earned working at his home in Gilbert, Arizona. In yet another case of extraterritorial taxation under the employer convenience banner, Delaware taxed Dorothy Flynn’s income for the days she worked at her Pennsylvania home, even though Ms. Flynn did not set foot in Delaware on these work-at-home days. This kind of extraterritorial taxation unfairly penalizes individuals who work at home. Home-based work is desirable for many individuals including persons who live far from metropolitan areas, parents of young children, and individuals who have trouble traveling. The deleterious impact of double taxing those who work at home explains why groups representing veterans, military spouses, persons with disabilities and other telecommuters oppose the employer convenience rule and the burden this rule unfairly causes when a state penalizes work at home by taxing income actually earned outside that state’s boundaries. In addition to the American Legion, groups opposing “convenience of the employer” taxation of nonresidents’ work at home now include the Christopher and Dana Reeve Foundation, Caregiver Action Network, The Military Spouse JD Network, and the Telework Coalition. New York Governor Andrew Cuomo correctly notes that New York cannot continue to be the “tax capital of America.” However, New York will deserve that moniker as long as it pursues policies like the “convenience of the employer” doctrine which taxes nonresident telecommuters on days such telecommuters work at their out-of-state homes and never set foot in the Empire State. To implement his commitment to improved New York tax policy, the Governor should declare the most recent Metro North disruption the last straw and permanently eliminate New York’s extraterritorial taxation of nonresident telecommuters on the days they work at their out-of-state homes. 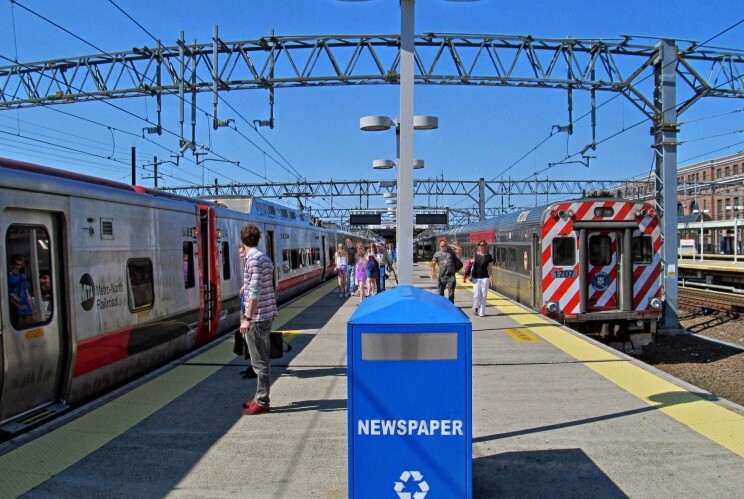 Senator Blumenthal and Representative Esty of Connecticut have called for hearings about the most recent Metro North service disruption. Given our experiences this year, it appears that such disruptions (and resulting calls for Connecticut commuters to work at home) will persist for some time. Accordingly, such hearings should address federal legislation to preclude any state from taxing nonresidents’ work-at-home via the convenience of the employer doctrine or any similar rule which projects a state’s taxing authority beyond its boundaries. For the next service disruption, those who follow the MTA’s advice to work at home shouldn’t be double taxed by New York State. Edward A. Zelinsky is the Morris and Annie Trachman Professor of Law at the Benjamin N. Cardozo School of Law of Yeshiva University. He is the author of The Origins of the Ownership Society: How The Defined Contribution Paradigm Changed America. His monthly column appears on the OUPblog. Subscribe to only current affairs articles on the OUPblog via email or RSS. Image credit: Cross-platform transfer between Mertro-North Railroad (left) and Shore Line East trains at New Haven Union Station. Photo by Pi.1415926535, Wikimedia Commons.